Offensive line coach Greg Austin announced after Wednesday's practice that junior guard Jalin Barnett has stepped away from football. "Jalin Barnett decided that it was in his best interest to step away from the game," Austin said. 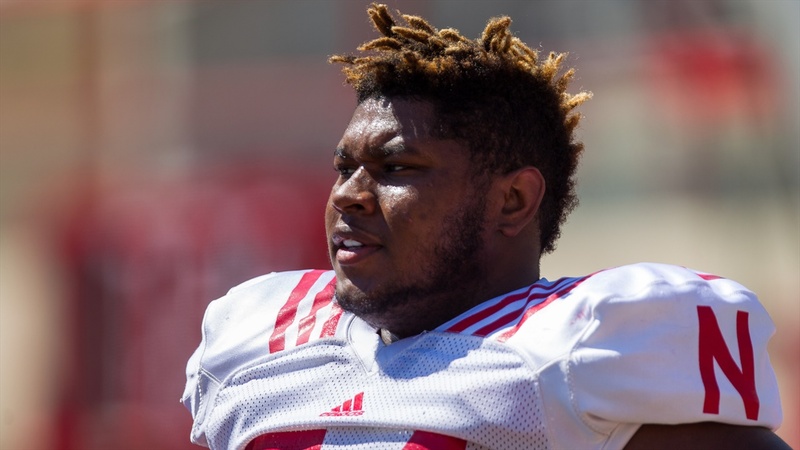 "I think Jalin sustained his fifth concussion – I think this is his fifth at the University of Nebraska; it's my understanding that he had a couple in high school prior to arriving here. "He's done a great job for us. He really improved his game since we arrived. I was really counting on him to give us quality depth and some quality back-up reps, but when you sustain those too many times, you kind of start thinking about it. He decided it was in his best interest to step away." Barnett "got dinged pretty good" last week, according to Austin, and entered the concussion protocol before making his decision. "He consulted folks that were close to him, friends and family, and then he came to my office an consulted me a little bit, but his decision was already made," Austin said. Barnett was a key piece of Mike Riley's first recruiting class at Nebraska. An Under Armour All-American, Barnett ranked as one of the top offensive guards in the 2015 class. He reported a slew of offers from some college football heavyweights including Alabama, Oklahoma, Tennessee and Arkansas before committing to Riley and the Huskers less than a month before signing day that year. Barnett earned Offensive Scout Team MVP honors in 2015 as a freshman while redshirting. He made his Nebraska debut the following season, appearing in 11 games, but did not find the field in 2017. "When a guy hangs up his shoulder pads, it's a sad day for whatever team he's on," senior guard Jerald Foster said. "The cliques that he's in – when I say cliques, I'm talking about the O-line -- it's really hard when you lose a guy. Jalin, he was a good friend, is still a good friend. I know for the o-line, at least speaking on our behalf, we're not just teammates, we're brothers. I understand if this isn't for him and this wasn't the path he saw fit for himself, I understand packing it up and being able to pursue other things." Barnett has left the team entirely at this point, although Austin said his door is always open. "He hasn't shown any interest in being around and being part of the team in another role," Austin said. "With school beginning this week, I think he's probably more interested in trying to attack school and that aspect of it ... I told him there was an open door policy, him and Michael Decker, both of those guys. I told those guys my door's always open and I'm here for them; that's why I'm in this business." Barnett's departure is the second for Nebraska this week and leaves the Huskers with 11 offenisve linemen on scholarship in addition to five walk-ons. On Tuesday it was confirmed that defensive back Will Jackson had left the team. A junior college transfer from Mesa (Arizona) Community College, Jackson joined the team in the summer.